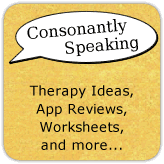 In speech-language therapy, it is important to let clients know why you are using the iPad for therapy and not for games. Even if you tell some children 1000x that you are not going to use it to play Angry Birds, some of them are going to want to play so bad that they will exit out of a therapy app to play a game. A few of my students have figured out that if you press the home button it will exit out of the application (some just grab the iPad and walk away). Until iOS 6 comes out, BubCaps are a great solution to help children stay in one app! 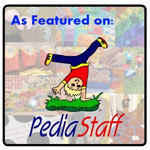 (To read more about the new updates to iOS 6 and in particular, its new "Single App Mode", Speech Techie has a great blog post on Apple's updates and what they mean for SLPs). A while back, Paperclip Robot (the company in which developed BubCaps) gave out fifty sample packs for parents, teachers, and therapists who could use them. I received a pack of my own. I haven't had to use them with my students yet due to the fact that I am on summer break; however, I have been bringing my iPad with me everywhere and allowing some of my friends' children to play with my iPad. They have definitely been helpful to have their children play game applications and stay away from my social media applications (Facebook/E-mail/Twitter/etc.). 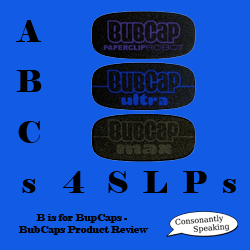 To read more about BubCaps, how to apply them, the different types of BubCaps, and my review of them, continue reading! Paperclip Robot states that BubCaps can be used on an iPhone, iPod Touch, or iPad that has a screen protector or case with caution. Be aware that BubCaps may cause removal of a screen protector if applied over the screen protector and removed. Paperclip Robot recommends cutting off the bottom portion of the screen protector so that the BubCap can rest completely over the "Home" button. In regards to cases, Paperclip Robot states that the BubCaps work on most cases except those that already have a rubber button covering the "Home" button. Paperclip Robot states that if you choose to remove part of a screen protector or case, it is at your own risk. In regards to re-use of BubCaps, they can be re-used if you are careful with removal and the adhesive bond is still strong. Be sure to test the bond. Many BubCaps come in packs of four so if one does not re-apply, you have more as back-up. Clean the screen around the "Home" button. Remove the backing from the BubCap. Adhere the BubCap directly over the "Home" button. If you need to move it around, remove it and try again. Once properly centered on the "Home" button, press firmly on each side of the BubCap for 30 seconds. Wait 15 minutes before use. The adhesive bond will increase for 48 hours. You may be able to remove these with a fingernail. Dig your fingernail underneath the BubCap until you are able to pry the cap off. If you choose to use a sharp instrument to remove the BubCap, you are doing so at your own risk. Removal requires a sharp tool (i.e. X-Acto knife, Olfa, or razor blade). Slowly dig the blade underneath the edge of the BubCap. Slow, steady pressure will allow the blade to get underneath and eventually it will pop off. Be careful not to cut yourself or scratch the glass. A removal video is available on Paperclip Robot's website. You can purchase BubCaps on Paperclip Robot's website or on Amazon.com. Until we determine how effective the new iOS 6 will be at keeping clients in therapy apps, BubCaps are the most cost-effective product on the market to provide this service. With so many different options available for your devices and low prices on four-packs, how could one not say these are a great product? I definitely recommend purchasing BubCaps if you are looking for something to keep your clients from pressing the "Home" button to play Angry Birds during therapy time! Paperclip Robot sent me a sample pack of BubCaps as a part of their giveaway of 50 on their Facebook page. No other form of compensation was given.